She used to love chomping all night. With anything that won’t end in a fight. Why won’t WallyBubba eat anything…? I’m so bored of watching her pick. And look at me like it’s a trick. Why won’t my daughter eat anything…? I’ve tried everything that I know. Why won’t my child bloody eat anything…? Humans can’t survive on yoghurt alone. Once the cheesy puffs are finished we go home. Why won’t she go back to eating anything…? When she just shoved everything in. So thank f@*k for petit filous and gin. My baby can only ever be guaranteed to want to munch on raisins or her own feet. Sigh. This is Scarlett a year ago haha. She would only eat yoghurt & cheesy puffs. I daren't leave the house without Wotsits! We have this problem. Still. No vegetables, hardly any fruit, no meat… It's just carbs and pudding for my lot 🙁 Hope WallyBubba improves better than my kids did! 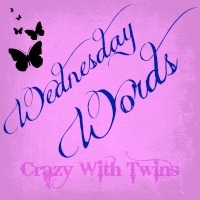 Just popping in from Wednesday Words. I have a child who eats everything (he's a 10 yr old boy! )and a stepchild who eats more or less nothing (11yr old boy!) so I sympathise! This is completely 100% z!! Cept he would live off milk and strawberries if I let him! I think they all do this. Just give her a bit of what you're having (minus the gin) and ride it out without stressing. In a few months she'll be back to eating everythingish again and you'll have to deal with the negotiations over how much is enough before dessert! Apparently when I was a toddler I didn't eat properly for nearly a year, my mum took me to the docs and everything. He said I would eat when I was hungry. Now I need my mouth wiring shut I eat so much!! 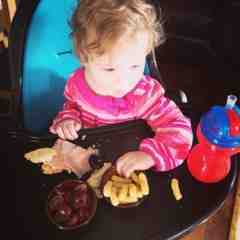 What mine won't eat in the high chair she will happily munch from the floor afterwards. After it's been trodden in. Do you have a pet, put her dinner in the pets food bowl (a clean one obviously). On the floor. She will probably have it eaten in 10 secs. Floor food. It's the future. Haha brilliant! Hope this phase passes quickly for you. When the twins finish each Frube – they cry because it has run out! lol. Thanks for linking up yet another brilliant poem, to #WednesdayWords – You really should write a book with all your poetry posts.